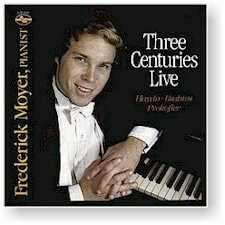 On his second recording for GM, Frederick Moyer offers an intriguing look at the similarities and dissimilarities between three masters of the keyboard -- Haydn, Brahms, and Prokofiev -- composing in the three great traditions of Western music: the Classical, the Romantic, and the Modern. (Also on GM Recordings, hear Frederick Moyer on Bach: Partita Number 5 in G Major, , Rachmaninoff: Corelli Variations, Reger: Studies for the Left Hand, , Walker: Piano Sonata Number 4, , Ravel: Valses Nobles et Sentimentales, Mendelssohn: Suite of Seven Pieces, , and Mussorgsky: Pictures at an Exhibition.) "A born pianist ... exhilarating." Recorded on 14 April 1985 live at Mechanics Hall in Worcester, Massachusetts, during the International Artists Series Recital.